Netherlands legend Johan Cruyff is currently battling lung cancer. It is not so much his failing health, but the current state of Dutch football that is leaving midfield great Johan Cruyff dejected. At football grounds across the Netherlands over the weekend, fans gave standing ovations in the 14th minute of matches in a tribute to Cruyff, who rose to fame in the number 14 shirt at Ajax. ”I’m very proud of the appreciation demonstrated by all the reactions,” Cruyff wrote in Monday’s edition of Dutch daily De Telegraaf. The former Ajax and Barcelona great gave no new details of his illness, saying he is still undergoing tests to determine what kind of lung cancer he has. After three paragraphs, Cruyff’s column reverted to its usual theme: Dispensing wisdom about football around the world and in particular in the Netherlands. He lamented poor performances by Dutch clubs including his beloved Ajax in Europe last week, saying tactical errors cost the clubs. Ajax and AZ Alkmaar lost in the Europa League while Groningen salvaged a draw. PSV Eindhoven lost 2-0 at Wolfsburg in the Champions League. Those results followed the elimination this month of the Netherlands’ national team from next year’s enlarged European Championship. 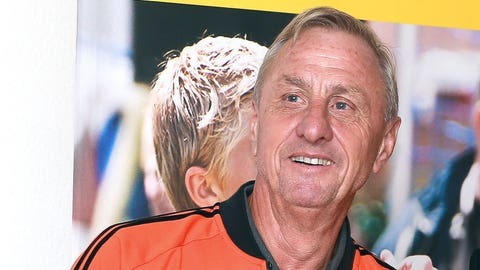 Cruyff’s criticism included that Dutch players ran too much with the ball and not enough without it, overcrowded the penalty area for corners and should have left a gap in defensive walls so the goalkeeper can see through it when a free kick is taken.